Expect new gadgets and advances to emerge while this year's big releases - tablet computers, 3D TVs, advanced cameras - become leaner and more compelling. Your mobile phone may take on a new role next year. It may become your credit card. Firms, including Visa, have installed contactless payment terminals in stores, but the same technology will soon feature in mobile phones. Called near field communication (NFC), the technology uses a chip to send a high-frequency signal that reaches 10cm from the phone. That signal can be read by a store's credit card terminal to make small payments. The technology has the potential to catch on in a big way this year after Google chief executive Eric Schmidt announced the company's second smartphone, the Nexus S, would feature an NFC chip and its software. Nintendo will deliver 3D games next year, with prototypes of its 3DS game console proving you can see 3D images without glasses. The game machine features a 3.53-inch autostereoscopic (glasses-free) 3D screen you can control with a sliding switch. A 3-inch touchscreen sits beneath it to control games, and the 3DS has two external cameras to capture 3D photos, an internal camera, microphone, motion sensor, slide pad and button controls. Recently Nintendo announced the 3DS would not only play special 3D games such as Kid Icarus Uprising and Mario Kart 3DS, but would also feature a virtual console to translate old GameBoy titles into 3D. The 3D game machine will sell for $300 and is due in stores in March. Apple knows better than to tell you about it until it's ready, but a second iPad is a sure thing for 2011. If the same schedule applies, we could see it appear in the US in April. New features are said to include two cameras - one at the front for FaceTime calls and one at the back for photos - and a USB port for added accessories. Other whispers give the iPad 2 a thinner form and carbon fibre body. Tablet computers will hit rush hour, after taking off in 2010, as traditional computer companies adopt the technology as their own. Acer will launch five tablets, including the unusual Iconia tablet, which features two touch screens, opens like a book and sits like a laptop. Toshiba, Dell, Lenovo, ASUS and MSI also are expected to release slimline tablets. The BlackBerry PlayBook also is high on the tablets-to-watch list. It shares a BlackBerry's internet connection to show email, videos, photos and documents on a seven-inch LCD screen. Smart cameras lost a lot of weight this year, and the digital diet won't stop in 2011. Panasonic will launch the smallest interchangeable-lens camera in its range - the Lumix GF2 - early in the year. Despite important additions, including a touchscreen, the GF2 will be 19 per cent smaller than its predecessor and seven per cent lighter. The camera will be able to shoot full high-definition video, adopt different lenses and even capture 3D photos with a 3D lens. Olympus also plans to drop advanced options into a new compact camera it promises will "expand the photographic capabilities of point-and-shoot users to unprecedented levels". The unnamed camera will feature a high-quality Zuiko lens and is due out in early 2011. The revolution might not just be televised, but streamed to TVs from the internet. Sony, Logitech, Intel and Google have teamed up to produce Google TV, a service delivering streamed and downloaded TV programs, apps and the internet to the biggest screen in your home. 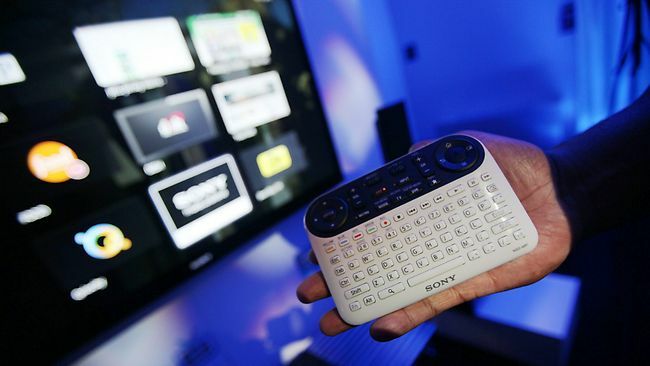 Sony launched a limited number of Google TV screens in the US late this year, while Logitech launched the Revue set-top box to add the service to existing TVs. Companies including Toshiba and Vizio are expected to launch new Google TV devices next month. Just when you thought your tablet or phone had reached app capacity, you'll need to find some more room. Plenty of new apps are primed to appear in 2011. One big new release coming is an Apple iPad-only newspaper called The Daily. The US digital newspaper (from News Ltd, publisher of The Advertiser) is rumoured to be making its debut next month. Google Android users can expect innovative apps to make their way to market in 2011, including the addictive Plants vs Zombies game. Mac users will also receive attention from app developers for the first time early in the year. Apple will open the virtual doors to its Mac app store in Australia on January 7. Sony PlayStation could be a surprise entry into the mobile phone market. Sony is strongly tipped to be developing a PlayStation portable phone together with Sony Ericsson. The phone, code-named Zeus, could look a lot like the current PSPgo game console, and is reportedly being developed to run Google Android software. It could provide serious competition for Windows Phone 7 handsets, which deliver Xbox gaming. Dell is another unexpected phone source. The computer maker edged into the market with the tiny tablet/part-time phone, the Streak, last year. The Dell Venue Pro, available in the US, is a Windows Phone 7 handset with a slide-down keyboard and generous 4.1-inch screen. Google hopes to challenge Microsoft's PC market dominance with its Chrome OS software, a basic operating system designed to hold most of its program data online. The software is designed to make smaller demands on computers. Google released 60,000 netbooks this month as part of a software test, though Chrome OS is not expected to launch publicly until mid-2010.